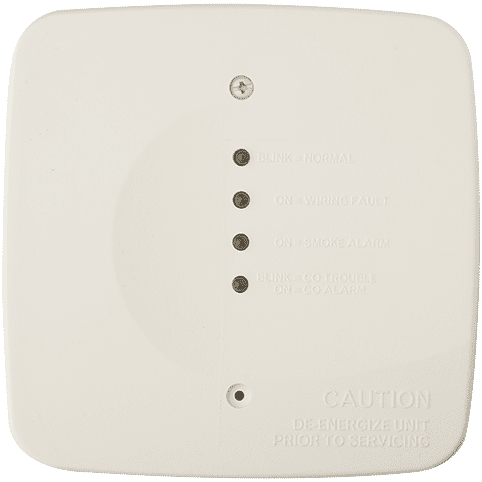 The Honeywell System Sensor COSMOD4W i4 series module is designed to interface between compatible i4 series combination CO/smoke detectors (Model COSMO-2W and COSMO-4W) and compatible security/fire panels. It can also be used to retrofit compatible i4 series detectors into an existing loop of i3 smoke detector models 2WTA-B or 4WTA-B, without adding wires. The module interprets signals and translates them into a separate smoke zone and a separate CO zone, each with alarm and trouble signals. The module will interconnect the detectors connected to it and alarm them in either Temporal 3 or Temporal 4 pattern. Optional triggers are provided to initiate multiple modules to sound. (an additional RSSMOD is not required) Local status indication is provided by 4 LED's and a 3 position DIP switch enables user configuration.